It’s time to roll up our sleeves and RECAP another week of The Rise! Let’s take a look at what happened last week in Manhattan, Brooklyn and Queens! We welcomed three new Risers to Washington Square – Peter, Michelle and Kenny! Peter’s winning smile carried us through THREE rounds of sprints. And by the time 7 AM arrived ALL of us were smiling! It was a wet morning, but that didn’t stop us from being total badasses. In fact, it only made us more badassey! Today we did a couple Brooklyn classics: A sprint + plank ladder, a circle circuit with the benches, and a Blur “Song 2” burpee burnout! We also did a sweet 30 second circuit with a deck of cards. Andy was the Jumble Champion today! This week Jiheng came and gave us some extra energy for a wet, snowy workout! This week Zoran, Tom, and Kerri threw some aerobics, isometrics, and a tough partner workout, but faithful Queens Warriors HIIT it out of the park. Thanks, Jiheng, and we’ll see you soon! It’s the 5th Wednesday of the month! And what else makes today so special? The Super Blue Blood Moon! Though I guess I totally missed it during the ball bag challenge 🙂 But you can find great photos of this beautiful lunar event online! This morning we have colleagues from work and friends who found us on the Sassy Fit Girl website joining us as new Risers! And Helene brought GIANT deck of cards to celebrate this GIANT turnout! For enduro, as the Bryant Park is hosting its third Winter Carnival, we lunged around the Ice Castle and did a 30-second plank, and repeated for 3 times. Another fun week at the New York Insight Meditation Center! This workout was all about partnering up. With four Risers and three segments in total, everyone got the chance to partner with everyone else! It was an especially high-fivey morning. What a big turnout we had! 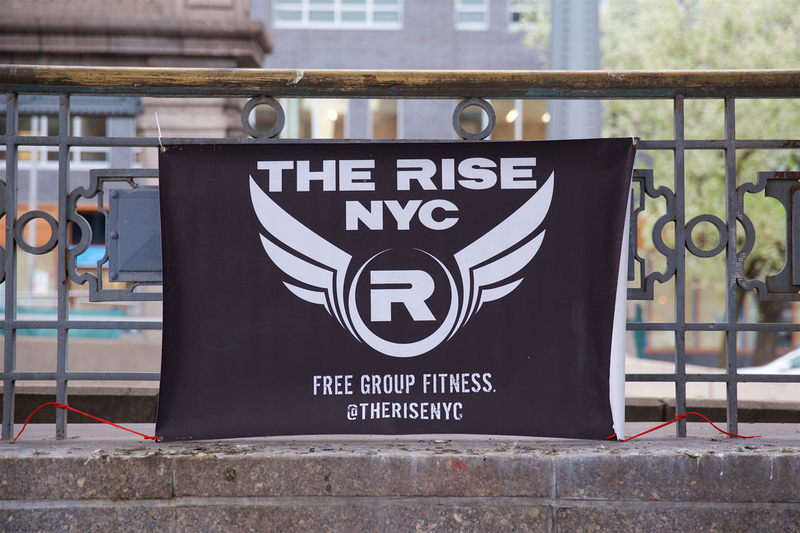 Is it because of the Rise Running Challenge we kicked off on Feb. 1? Or because it was Jiheng’s last Friday Rise before his (temporary!) move to California? Or maybe it’s just because Friday morning hill sprints are friggin awesome and we don’t need any special reasons to knock them out!